The outcome of radio meteor observations of a basic monitoring system based on forward scattering can be enhanced by additionally analysing meteor head echoes. Meteoroids of common origin (radiant) are characterised by similiar geocentric velocities and parallel trajectories. They produce in a circumscribed area of reflection a bunch of head echoes with equally Doppler shifted frequency gradients. The observed frequency gradients are a result of velocity and angle of incidence of the meteors. So different radiants produce different groups of frequency gradients. These groups can be made visible as hot spots in a kernel density map. In this way spatial different sources of meteoric activity in the sky can be detected. E.g. Fig. 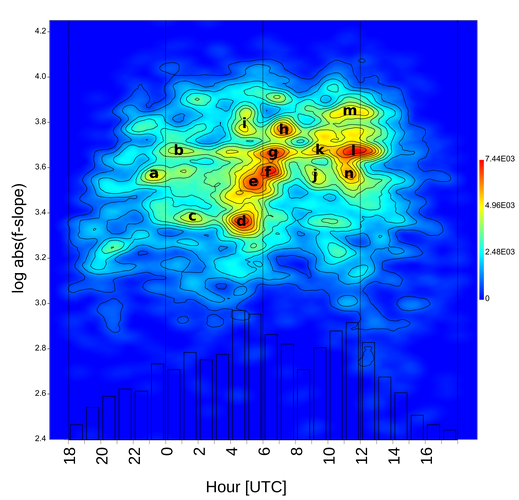 1 shows the kernel density map of the frequency slopes of all received head echoes during the outburst of the Draconids in 2018. Fig. 1: Kernel density map of the frequency slopes of the headechoes (dots) registered in the days around the outburst of the Draconids in 2018. The Draconids (DRA) depict as well distinguishable hot spot on October 08th. Beyond the Draconids sporadic meteors are visible also. Especially the antihelion- (AH), apex- (AP) and helion-source (H) as regions of increased activity are discernable. The dotted lines mark 00h, 06h and 12h UTC each day. Performing such measurements a radio meteor detecting system is required that is able to pick up meteor head echoes and their frequency change with a sufficient time and frequency resolution. For this purpose the software Meteor Logger was written. A detailed description of the procedure is published in the Journal of the International Meteor Organization: Kaufmann W. (2018): "Visualizing meteor streams by radio forward scattering on the basis of meteor head echoes". WGN, The Journal of the IMO, 46:1, 39-44. You can read the article here, its Figures 4-7 can be viewed in the supplement in high resolution. Sporadic meteors are considered as meteors not being part of a recognized shower. The distribution of the radiants of sporadic meteors within the celestial sphere were subject of a number of surveys. Since 1956 it is known that the sources of sporadic meteors are non-homogeneously distributed in space. 6 regions with increased activity are established meanwhile: north and south toroidal source, antihelion (AH) and helion (H) source and north and south apex (AP). Fig. 2 shows the result of an radio observation of sporadic meteors based on the above described technique and started at the beginning of 2018 shortly after the Quadrantids maximum. It was extended to mid-February. This time span was free of major meteor showers which allowed for an unbiased observation of the sporadic meteors. Fig. 2: Kernel density map of the frequency slopes of head echoes from 40 x 24h of continuous observation (Jan 5th-Feb 14th). The cumulated head echo counts per hour are added as bar chart (Maximum 247 Head echoes/h). Daily time span is 18h-17h59m UTC (= 19h-18h59m local time). The positions of high density hotspots are marked by lower cases. The bar plot of the cumulated hourly count rates of the head echoes (see Figure 2) exhibits three peaks. They occur at daytimes that coincide with the highest radiant positions in the sky of the AH, AP and H source, respectively. It can be assumed that these peaks are mainly the manifestation of the activity of the AH, AP and H source with minor contribution of the northern toroidal source as well as sporadic meteors that do not belong to one of these sources. 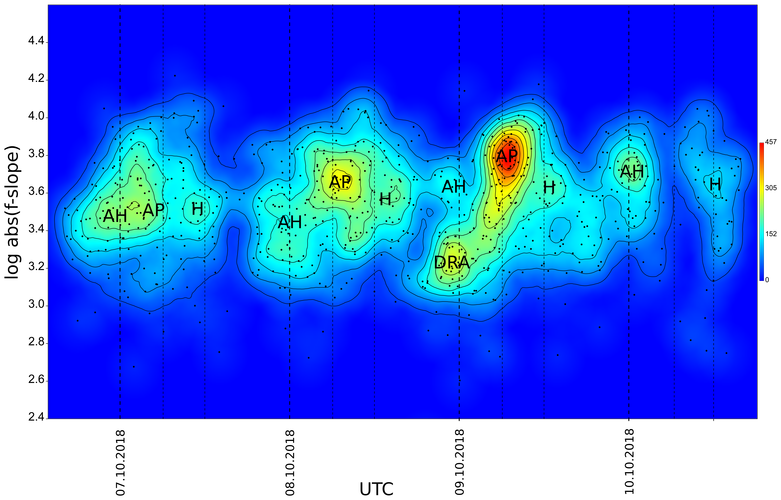 In Figure 2 the hot spots exhibiting higher density are marked with lowercases a-n. They can be clustered into three groups by daytime which can be assigned to the AH (a-c), the AP (d-i) and to the H (j-n) peak of the head echo count rates. So for the period 2018 January 05th-February 14th at least 14 different major radiants could be distinguished basically within the AH, AP and H source by this technique. In detail this approach is published in the Journal of the International Meteor Organization: Kaufmann W. (2018): "Visualizing sporadic meteor radiants and their dynamics by radio forward scattering". WGN, The Journal of the IMO, 46:6, 201-204. You can read the article here.